Consumer culture has shaped us into a people who have almost no limits on our desires. Indeed, our current political system treats purchasing more and more things as a right—nay, a responsibility!— one that ensures the economy is successful. Everyone has a right to develop their own form of life, grounded on their own sense of what is really important or of value. People are called to be true to themselves and to seek their own self-fulfilment. What this consists of, each must, in the last instance, determine for him- or herself. No one else can or should try to dictate its content. (The Ethics of Authenticity, 14). For those who seek to follow the Lord Jesus, this is a problematic cultural setting. We are called to die to self (Rom 6:4–8; Gal 2:20), not to elevate our own desires to the position of supreme importance. And yet our churches are filled with people who, having been taught by our culture to follow their own hearts, look no different to the society of self-fulfilment that surrounds them. The truth is this: we have failed to discipline ourselves as followers and communities of Jesus. We have let ourselves be trained by a consumeristic culture, rather than the practices of the Christian tradition. Take fasting, for example. It used to be that fasting was a normal and regular part of the Christian life. Some communities around the world today still fast once, even twice, a week. Why do they do it? To earn spiritual merit? No! They do it because learning to be more like Jesus is not just a matter of good intentions, much less an automatic process. It is something that we must train for. 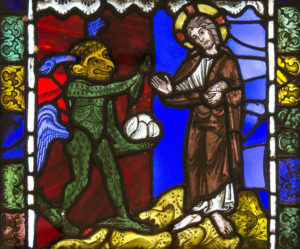 The devil tempting Jesus with bread from stones. Fasting is an act of overcoming our self-centredness. It recognises our passions and desires—whether for food or comfort or whatever—and refuses to let them control us. This is not suffering for the sake of it, much less some kind of self-flagellation, but rather learning to say “No!” to our desires so we can train our hearts to say “Yes!” to God. Those who fast learn to control their hunger or desire for comfort so that they can also learn to control their other, more harmful passions—greed, lust, envy, anger and so forth. We start with the simple desires so we can learn to master the deeper, spiritual ones. Those who fast learn to control their hunger … so that they can also learn to control their other, more harmful passions. Even Jesus needed to fast because even he, fully human, needed to master his desires. Jesus’ fasting in the desert for forty days and nights (Matt 4:1–11; Luke 4:1–13) didn’t make him more vulnerable to the devil’s temptations—it made him better able to resist them. The spiritual strength gained from fasting meant Jesus could assert that the devil’s word was not God’s word, that the devil’s way was not the way of the kingdom. I’m as undisciplined as anyone, and it shows in my life and the things I desire. So, I’m going to begin to fast—regularly, and accountably—so that I might master my desires and learn to be in the world but not of it. So that I might learn to be more like Jesus. Praying the Psalms An inclusive church?